Many Pokemon have the capability of Evolving in Pokemon Go. When a Pokemon Evolves it advances to a much stronger form. Evolving a Pokemon requires a certain amount of Candy. Candy is collected by capturing Pokemon. When a required number of Candy is collected, you will have the option of evolving a single Pokemon. Candy is specific to the species of Pokemon captured (Eg. Bulbasaur, Squirtle, Charmander). Evolved Pokemon will show a significant increases in CP. You can capture evolved forms of Pokemon in the wild, but Evolved Pokemon of the same species will generally have more CP. 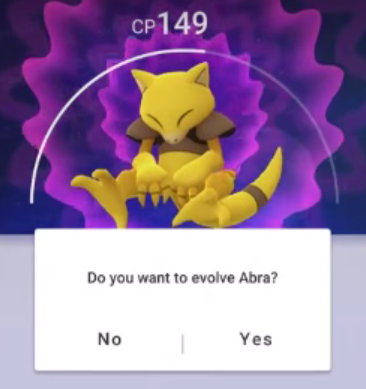 In addition, when choosing to Evolve a Pokemon, make sure to pick the one with the highest CP to maximize CP potential. Stardust and Candy can be used to Power Up a Pokemon, increasing its CP and HP. While individual Pokemon cannot Level Up in Pokemon Go, your Trainer can. By gaining Experience Points (XP) your Trainer will Level Up and become more powerful. There are many opportunities to gain XP in Pokemon Go. The main ways include Capturing Pokemon, Evolving Pokemon, Winning Gym Battles, Visiting Pokestops, etc. Note: Capturing a new Pokemon will grant bonus XP. After gaining enough XP you will advance to the next Trainer Level. Each Level will require more XP, thus Leveling Up becomes more difficult later on in the game. Although it may take a while to reach the max Trainer Level, Leveling Up your trainer is the best way to build up a stronger Team and progress further in the game. As you continue to gain XP and Level Up you will notice that the CP of nearby wild Pokemon increases along with you. Not only will you begin to see powerful Pokemon in the wild, these Pokemon will become easier to catch. For example, a Pokemon that used to be a Very Difficult Catch a few Levels ago, may now happen to be only a Medium Difficulty Catch. 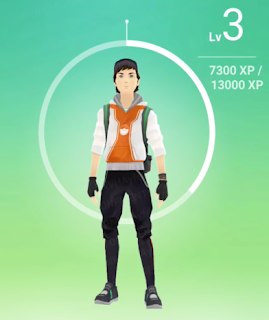 In addition, to being able to capture higher CP Pokemon, you will be given item rewards as you Level Up. For example, you may receive a few Great Balls for reaching a certain Level. A few Levels later you may be rewarded with a few Ultra Balls or even a rare Master Ball. Keep progressing to earn those rewards! Here are five quick tips on How to Gain XP Fast.